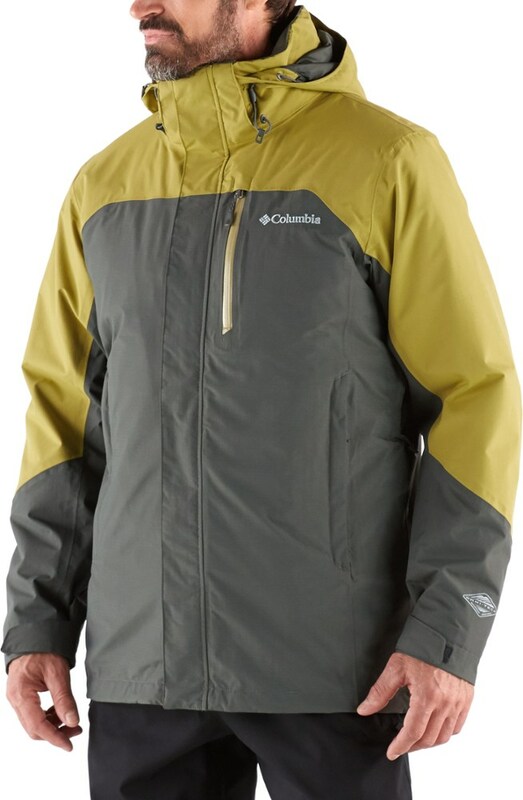 Longer-length rain jacket with zipped-in synthetic insulating jacket. 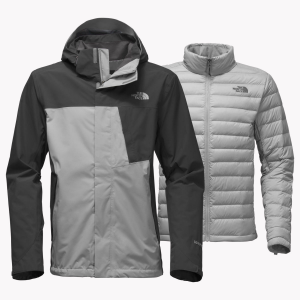 The outer jacket is not suitable for hiking, but the inner on its own is. I was surprised to find the Craghoppers 364 3-in-1 jacket listed on Trailspace because I would not consider it a hiking jacket. 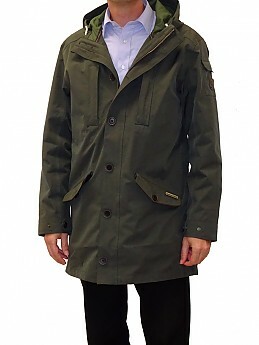 It is made of a stiff polycotton canvas, meaning that it is bulky and heavy even without the inner insulated jacket. 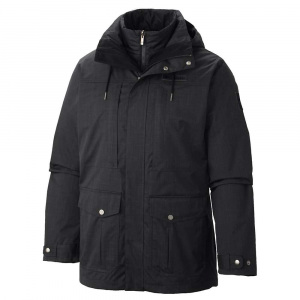 Furthermore the hood is the urban variety, adjustable to some extent thanks to waxed cords on the front and a tab on the back, but lacking a peak or wired brim and offering limited protection against wind-blown rain from the front. 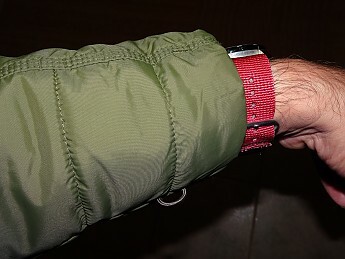 I bought this jacket for urban use as an alternative to a macintosh, and for this purpose it is excellent. It reaches down to mid-thigh, easily long enough to be worn over a suit. 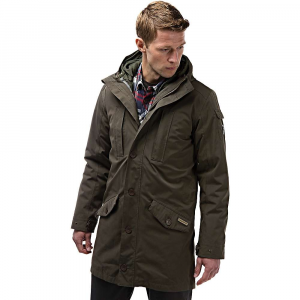 The outer jacket has a two-way zip which is a little fiddly to do up, but handy when you need to reach your trouser pockets. The hood might not be great but at least it’s there, meaning that, unlike the typical macintosh, this jacket can actually be worn in the rain. The outer jacket has wide sleeve cuffs which easily accommodate the sleeves of a suit jacket. The inner jacket has elasticated cuffs, but these too can be pulled on over your lower layers (even a suit) fairly easily. 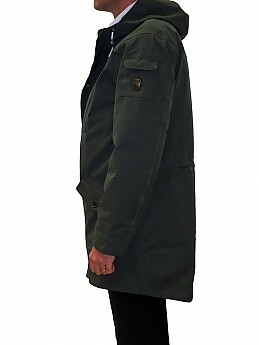 The outer jacket has two hip pockets, two external chest pockets, an inside chest pocket, and a pocket on the left sleeve. The inside chest pocket contains a mobile phone pouch, but this is awkwardly placed and hard to use. Other Craghoppers jackets have a mobile phone pouch in the right hip pocket, which is a far more accessible location. 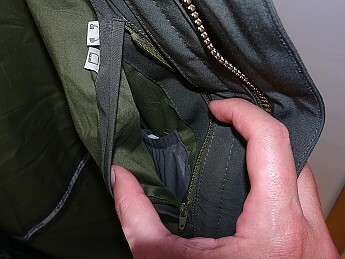 The inside chest pocket itself gets covered up if the inner jacket is zipped in, but then the inner jacket has a large inside chest pocket of its own. 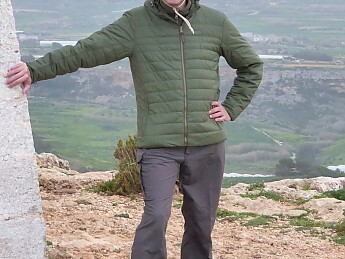 Other Craghoppers jackets have separate zipped handwarmer pockets behind the hip pockets. This one doesn’t, and I miss them. Instead, the hip pocket openings are angled to make putting your hands in easier. The hem of the outer jacket is angled so it is lower at the back, which seems unnecessary given its length. However, the back of the hem can be folded up and secured with press studs. The downside of this arrangement is that when you sit down you have to arrange the jacket so you don’t sit on the studs. 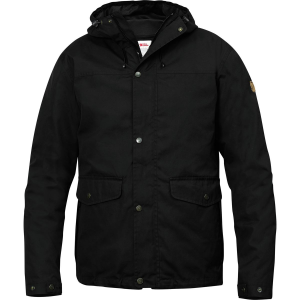 The inner jacket uses a synthetic fill and has its own hood. The fill is Craghoppers’ own proprietary ClimaPlus, which I do not think is of the same quality as the PrimaLoft used by other manufacturers. 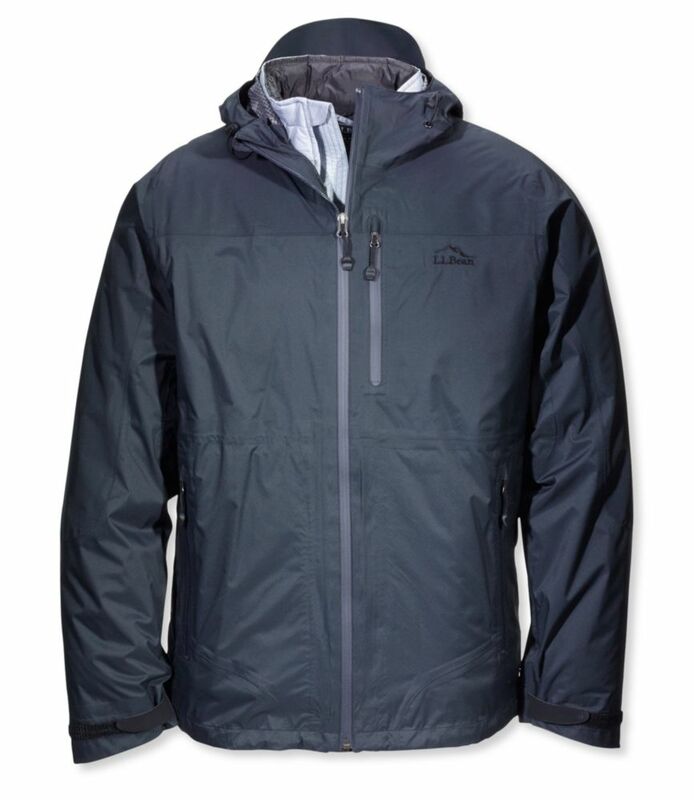 Still, the inner jacket on its own is usable on hikes as an extra layer to throw on during rest stops in exposed spots or after pitching camp. The inner is reasonably lightweight at 520g or 1lb 2oz (size large) and it packs into its own inside chest pocket. It also has two zipped pockets at the waist. 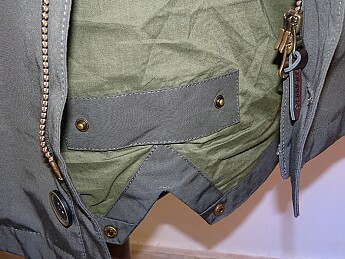 Neither the hood nor the hem of the inner jacket is adjustable. In spite of this, the inner is warm when worn on its own and does a very good job of keeping out wind. In the past I have found three-in-ones to be impractical, but this jacket makes the system work for urban use. This is thanks to two things. 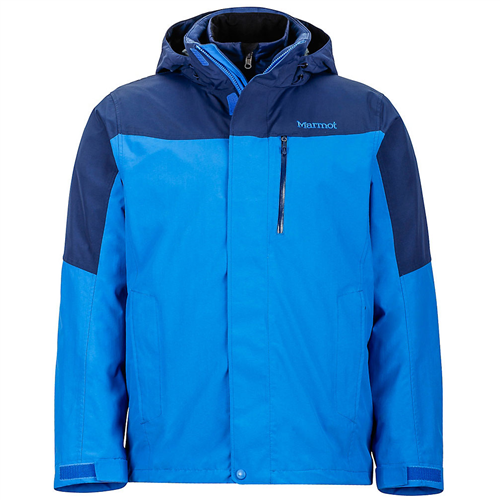 Firstly, while many three-in-ones have fleece inners, this one has a smoothly lined insulated jacket which slides over your other layers easily, so putting it on presents no problems. Secondly, the inner attaches to the outer securely by means of loops and tabs at the cuffs and the back of the neck. This means that when you take the combination off you won’t pull out the sleeves of the inner, a problem with some other three-in-ones. With the inner zipped in, the jacket is good for winter. With the inner removed, it becomes usable as a raincoat in milder temperatures as well. The fact that the inner on its own makes a good hiking jacket is a bonus. The one real drawback to this jacket is the stiffness of the zips. Zipping the inner to the outer and removing it is not as easy as it should be. The zip of the inner can also catch when it is being worn on its own. Zips apart, the jacket is well made. The sizing is also good. I am 6'1" with a 41-inch chest. The large fits me well with ample room for lower layers (including a suit) and the sleeve length is spot on. Interesting jacket. Thanks for sharing the review. Yes, sometimes some products get by us and onto the site! Thanks for the review though.